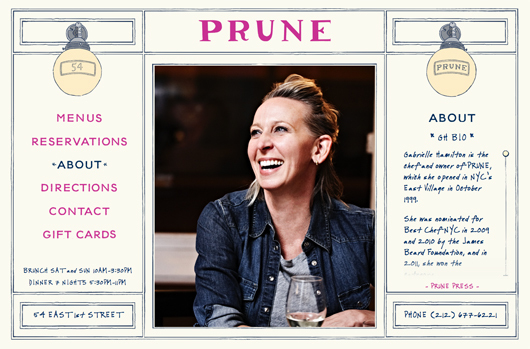 Today, I am overjoyed to make a long awaited announcement…..
PRUNE Restaurant’s new website is LIVE!! 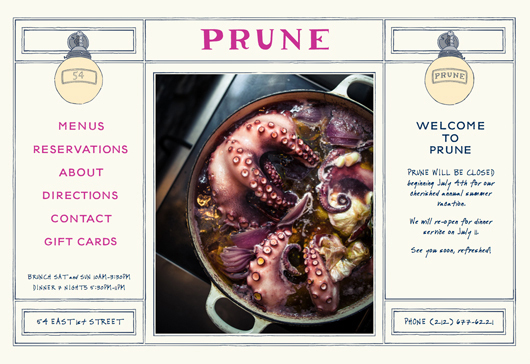 Sometime ago I was contacted by Tyla Fowler, assistant to Gabrielle Hamilton, and asked whether I’d be interested in redesigning Prune’s website. Of course, my response was “Absolutely!”. I remember when I first heard Gabrielle Hamilton on the radio, speaking about her book Blood, Bones & Butter, I was immediately so taken by her…. and after reading her book, even more enamored. So, now, here I am being contacted to design her restaurant’s new website?! I wondered if maybe my connections to the restaurant world (Chez Panisse, Camino, Pizzaiolo, etc.) had somehow lead her to me, but it turns out, Tyla came across my work in an interview I did with Design Sponge! Thank you Design Sponge! I knew that this was a substantial project, one that I didn’t want to take on alone, so I asked my dear friend and talented colleague, Tracy Lenihan, to work with me. Tracy and I had worked together before, but nothing of this scale. It was wonderful to tackle such an exciting and challenging project with a trusted collaborator. I’d also like to give great thanks to Andrew Venell for all of his amazing hard work programming the site. 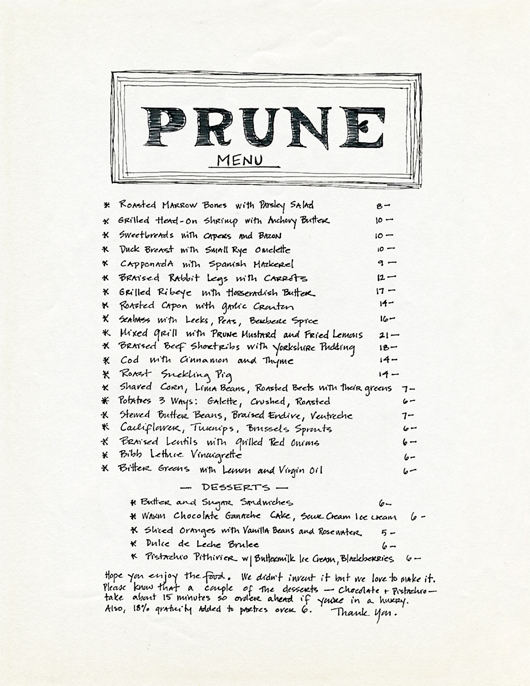 I was fortunate enough to dine at PRUNE twice during this project. It was wonderful to meet Gabrielle face-to-face, experience the delicious food, the generous hospitality, and really get a sense of the place – first hand. The restaurant is charmingly small, I truly felt as if I was in Europe. I love how the French doors open onto the street (as shown in the above photograph, courtesy of Eric Wolfinger, thank you Eric!). The tables are nestled so close to one another that it feels more like a dinner party at a friend’s house. 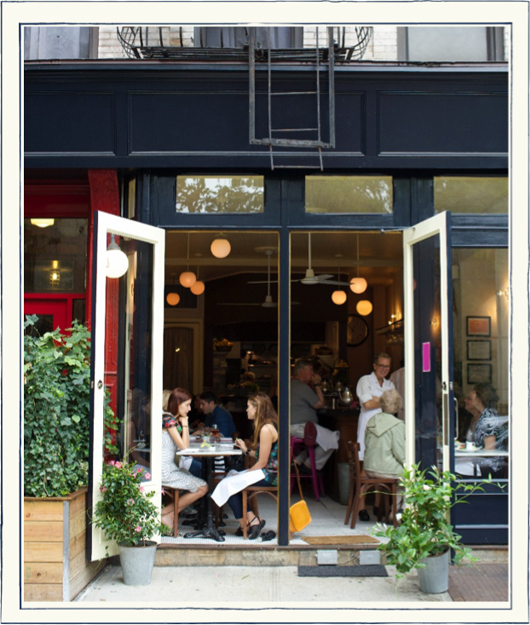 It has a lovely intimate feel, the quintessential neighborhood restaurant. It was this warm, welcoming, and inviting experience that we wanted to capture in the design of the website. When Gabrielle told me that, for a long time, she used to write each daily menu by hand, I knew she was my hero! A true fellow Luddite! (the above menu is an old sample in Gabrielle’s distinctive hand). 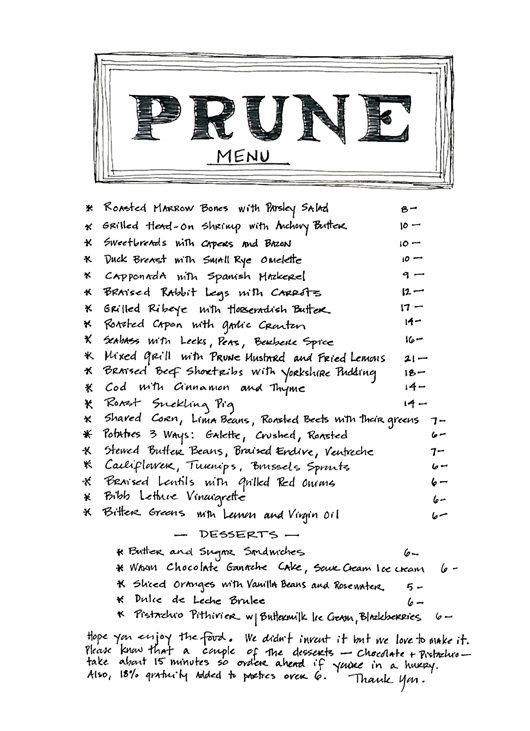 This year is PRUNE’s 15th anniversary and it was only a few years ago that they stopped using handwritten tickets. We wanted to retain this lo-fi and handcrafted feel throughout the new site. Working closely with Gabrielle has been an incredible experience. She is an amazing person; wicked smart, insanely hardworking, dedicated, full of grace and great humor. I am “struttingly proud” of the results!